The individual district profiles are available in PDF format under each year's tab. 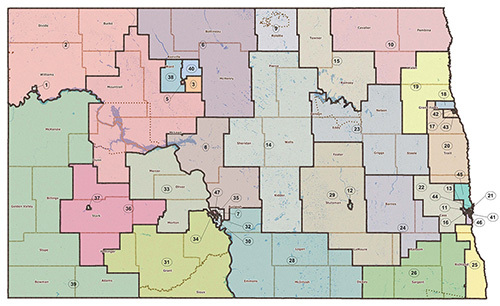 If you want additional information about your district, such as specific information on legislative assembly members or a detailed boundary map for each of the 47 state legislative districts, visit the North Dakota Legislative Branch website (or click on the map below). Please note that the North Dakota Legislative Branch is not responsible for the content or production of the profiles. Of the 16 measures included in the profile, 15 are based on data from the U.S. Census Bureau's 5-Year American Community Survey (the one exception is the Average EITC Credit which is obtained from the Brookings Institution). Caution is needed when using the multiyear estimates for assessing year-to-year change in a particular measure. This is because four of the five years in the 5-year estimate overlap with the next year’s estimate. Ideally, trend analysis with multiyear estimates should be done using estimates from non-overlapping periods (i.e., 2008-2012 data in our 2014 profiles and 2013-2017 data in our 2019 profiles). We are also asking for your feedback! Your responses to the legislative profiles user-feedback survey will help us plan for and improve our future efforts.